The Scottish Rugby Union has revealed a brand new Scotland Sevens alternate jersey that the team will be wearing for the next 12 months, presumably starting at this week’s Rugby World Cup Sevens in San Francisco. The new jersey, which replaces last season’s red change shirt, is as usual produced by Macron, and closely resembles the basic pinstripe-hoop design of last season’s away and the home shirts, the latter of which will continue to be worn for another season. 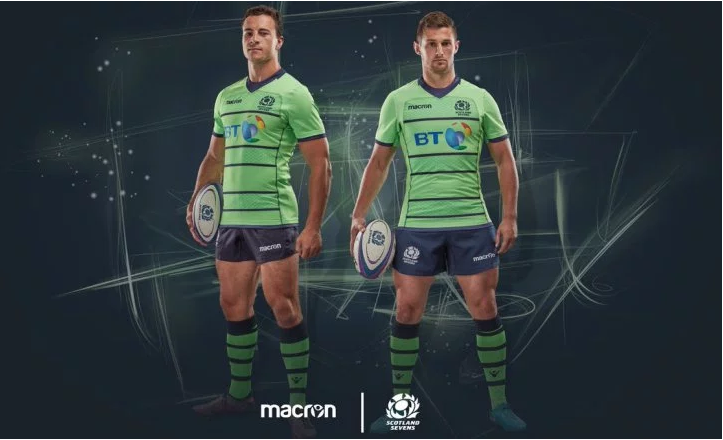 The most notable change is of course red for a very unconventional lime green, accented with classic dark blue pinstripes and trim, plus the same saltire-inspired sublimation on the top of the chest. Keep an eye on Rugby Shirt Watch for our review of the new Scotland Sevens alternate shirt and all the latest 2018/19 kit releases as they appear by following us on Twitter or Facebook. QUIZ: Can you name these 12 Premiership rugby players?